The Edenton Chowan Partnership Education Project acknowledges that a high quality educational system, pre-kindergarten to post-secondary, is vital in building and sustaining a strong community and local economy. In order to provide such a system, which meets the needs of every child, leaders at all levels of the education, nonprofit, community, civic, and philanthropic sectors must work together to tackle some of the most pressing challenges. As such, the Partnership’s Education Project serves as a catalyst for working together, across sectors and along the educational continuum, to produce better educational results in Chowan County. This link takes you to the 2017 NC School Report Card. Every child comes to school prepared for kindergarten. Every child succeeds academically in school. Every child graduates from high school prepared for post-secondary school, vocational school and/or to enter the workforce. Every child has the opportunity to attend a high quality post-secondary school. The current focus is to provide more community interaction, to increase collaboration between the agencies and to foster a climate where new ideas can be pursued. An example of the later is the current one-to-one computing device pilot at the high school. 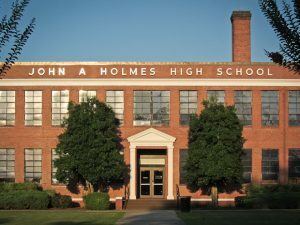 The North Carolina High School Scholar Athletes Association named the John A. Holmes High School Cheerleading Team as the sports team with the highest team GPA for the state. Coming in second in the state is John A. Holmes’ Women’s Tennis Team. Check out the full story here. College of The Albemarle is proud of the many students who began their higher education journey with us. Whether you graduate with your degree, diploma, or certificate; you just take a few classes to gain new job skills; or maybe you came to us seeking your GED or Adult High School diploma, you are a success story to us and to many others in the community. We hope you enjoy reading these success stories and we look forward to writing your success story in the future! Nursing Passion Fulfilled at COA – Jean Bunch, R.N. The Edenton-Chowan campus of the College of the Albemarle takes pride in offering Culinary Technology, Air Conditioning, Heating, and Refrigeration Technology (HVAC), and Electrical Technology as specialty programs. To learn more about these programs, click here. Check out Edenton-Chowan School’s Report Card from the North Carolina Department of Public Instruction by clicking HERE. The report card will provide information about student achievement, class size, school safety, school technology, and teacher quality. Their website is home to all types of education data.